NEW! 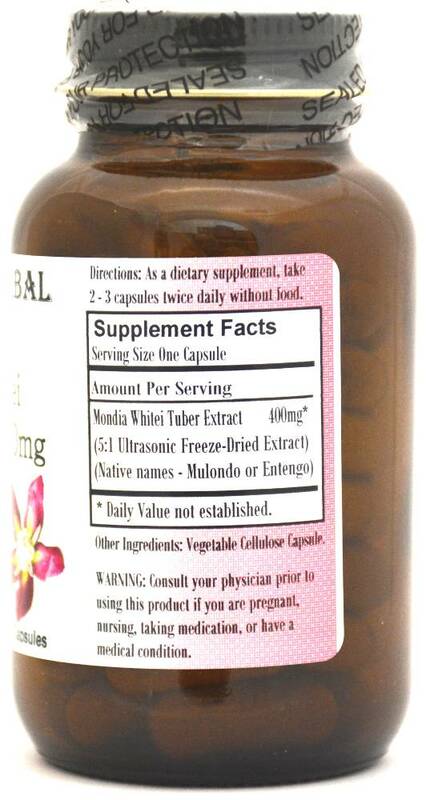 Barlowe's Herbal Elixirs now brings you Mondia Whitei tuber 5:1 freeze dried extract . Mondia, an herb native to South and Central Africa, may be helpful for libido. In Africa, the common native names for this are Mulondo, Gondolosi, African Ginger, or Entengo. Bottled in Glass! No Stearates! No Fillers! No Junk! 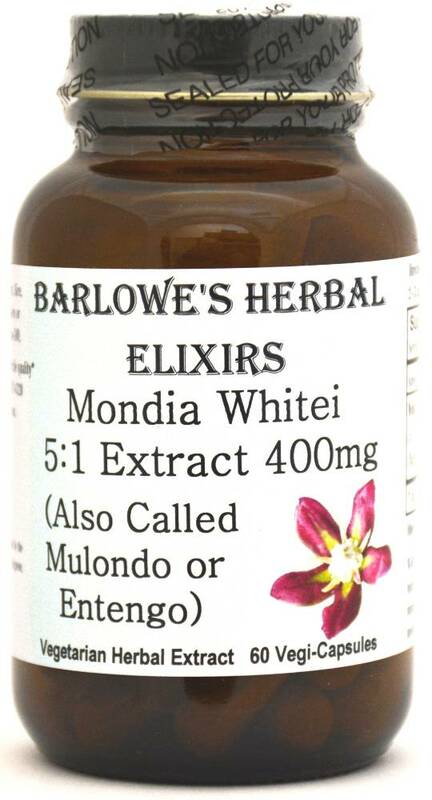 Barlowe's Herbal Elixirs now brings you Mondia Whitei tuber 5:1 freeze dried extract. 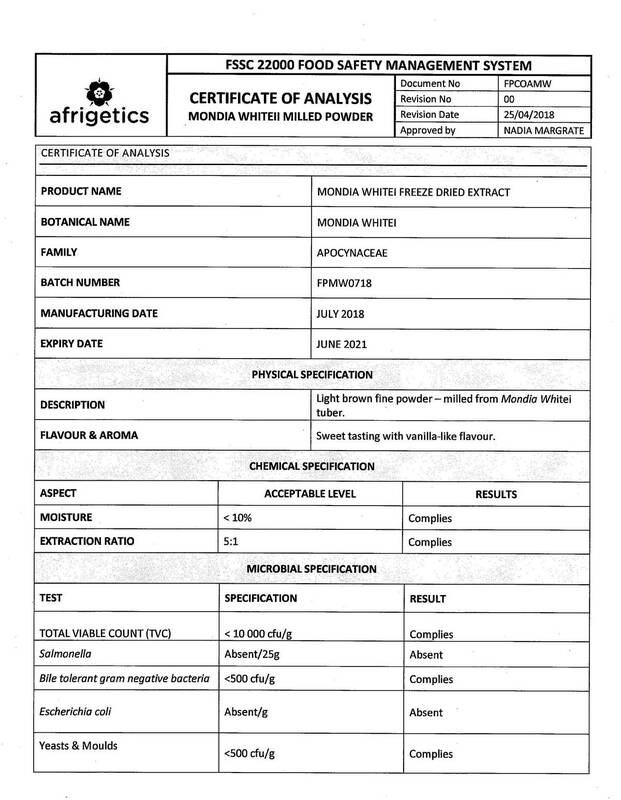 The Certificate of Analysis (COA) for this particular batch is shown above. Mondia, an herb native to South and Central Africa, may be helpful for libido and blood flow. In Africa, the common native names for Mondia are Mulondo, Gondolosi, African Ginger, or Entengo. It has been utilized for centuries in Africa. Note: The dosage on this product is fairly high. It is hard to determine the proper dose, but based on what we could find, the recommended dosage appears to be as a dietary supplement, around two to three capsules twice a day (a somewhat lesser dosage than with the previous Mondia powder). Bottled in Glass! No Stearates! No Fillers! No Junk! Directions For Use: As a dietary supplement, take two or three capsules with water twice daily. The dosage on this product is fairly high. Results and usage amounts may vary based on body type and weight. You should experiment with the dosage. See Above.